1. Quiz: Of which country is Irian Jaya a province? 2. Quiz: What lies between Colon and Balboa? 3. 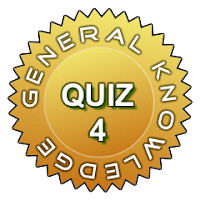 Quiz: What is divided or classified according to the Dewey decimal classification system? 4. Quiz: What is divided into three types ballas, bort and carbonado? 5. Quiz: The world's largest rock is regarded as sacred by the Aborgines. What is it called? 6. Quiz: Who were the Piccards? A Swiss family of scholars, scientists and explorers noted for their contributions to science and public affairs. They included Auguste Piccard who explored the upper atmosphere and his twin Jean-Felix, who descended to a depth of 3150 metres. 7. Quiz: Who is Don Stephen Senanayake? 8. Quiz: What is the current name of Batavia? Djakarta, Capital of Java and Indonesia. 9. Quiz: In demography what is the difference between fertility and fecundity? 10. Quiz: Hana Matsuri or the Flower Festival is one of Japan's most important festivals. What does it celebrate? 11. Quiz: What is the strait between Greenland and Iceland called? 12. Quiz: What is legal fiction? 13. Quiz: Five of the six highest railway stations in the world are in China. Where is the sixth one? 14. Quiz: Complete the advertising slogan by PETA (People for Ethical Treatment of Animals): "It takes up to 40 dumb animals to make a fur coat but ... ? "only one to wear it". 15. Quiz: On the banks of which river is Jammu situated? 16. Quiz: What was established by Henri Desgrange in 1903? 17. Quiz: What, in education, is tracking or streaming? The isolation in classes of pupils who are homogenous in age or intellectual ability. 18. Quiz: Which was the first Himalayan peak beyond 8000 metres to be scaled? Annapurna, on June 3, 1950 by a French expedition led by Maurice Herzog. 19. Quiz: Give the full form of CAT scan. 20. Quiz: How many members can one US state send to the US Senate? Two (irrespective of the population of the state). 21. Quiz: The Croats and the Serbians use two different alphabets; the Croats use the Roman script and the Serbians use Cyrillic. Their religions show a similar difference. What is it? Croats are Roman Catholics and Serbs are Eastern Orthodox Christians. 22. Quiz: Who established the Noble prize for Economics? 23. Quiz: Who first formulated the philosophical doctrine of dialectical materialism? 24. Quiz: Who said that in a post-industrial society the rate of change is such that "reality seems like a kaleidoscope run wild" and also that "Change is avalanching on our heads and most people are unable to cope with it." 25. Quiz: Which respected scholar and historian served as India's ambassador to China between 1948 and 1952? 26. Quiz: Who developed the system of library classification ca lied the Colon Classification? 27. Quiz: Saddam Hussein was the leader of Iraq's Baath or Baathist party. What does the word 'baath' mean in Arabic? 28. Quiz: Who introduced into sociology the idea of charisma? 29. Quiz: What is Parkinson's Law? That work expands so as to fill the time available for its finishing point. 30. Quiz: Which psychologist spoke of the pleasure principle?